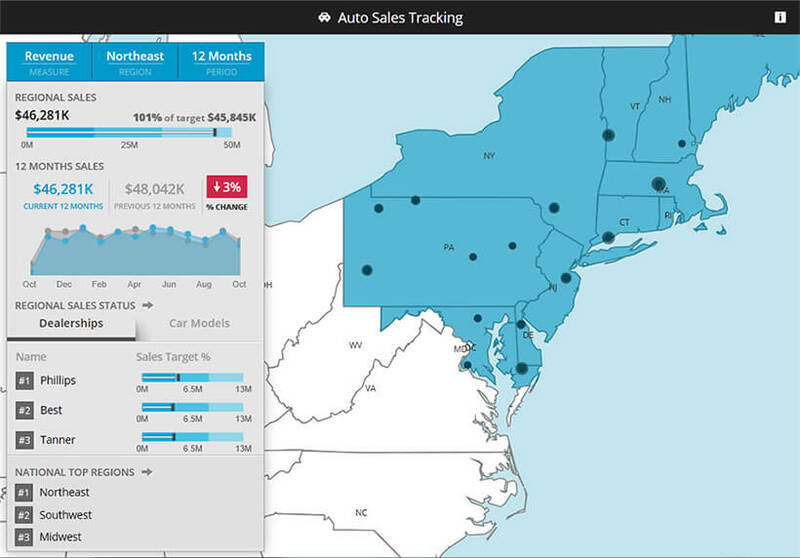 The Auto Sales Tracking sample is an example application showcasing some of the most powerful Ignite UI controls including the map, grid, and various charts. The map control shows the geographical region represented in the sales data. Bullet graphs, data charts, and pie charts show sales figures over time and in relation to target figures. Sales are detailed using the grid control by dealership and manufacturer and bullet graphs embedded in the grid provide glanceable sales summaries. The application demonstrates how Ignite UI controls are used together to build an immersive and attractive user experience.